It takes so much time to blog! Especially when I have so many photos to upload. Be patient with me as I upload Italy photos. Here is Day 2 of our trip! 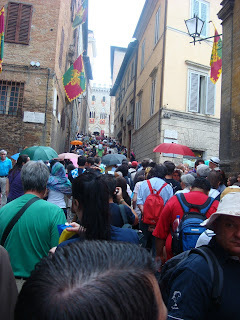 The first day we toured Siena and all it's pre-Palio race hoopla! It was relatively light in traffic. The second day(July 2, 2011) was filled with lots of fun things happening. We got up late and I went down to the pool hoping to get in a short sunbath and swim. That didn't happen exactly as everyone was around a table having some discussion and the President of the company was coming down with his family. So, I enjoyed some time meeting them. Matt came down and someone from the hotel asked if one of us wanted to have a complimentary massage. I was chosen after a little hemming and hawing. It was wonderful but a bit weird. First of all, it was a quiet, dark but cozy room that was off the main reception area. It was very private and had a table, sauna room, and claw foot tub in it. The masseuse was very nice, but I couldn't understand much of what he said. He handed me a little package (I do mean little) and asked if I would change into it and lay on the table. He left so I could do that. I opened it to find a TINY transparent paper thong and nothing else. OMG> I was ready to back out of this but I sucked it up (and sucked in my stomach) and did as he asked. I grabbed a towel and put it over my backside too. Tee heee... he seemed to be fine with this and took it as a hint that I was a self conscience American. He asked me where I was from and where I have the most stress. I told him in my shoulders and he went to work. It was fabulous! He was very professional and i was very relaxed. After I was done, I got dressed and found the everyone was in the small banquet room eating lunch. Oops.. Well, I came in and felt very much like jelly. It was a delicious meal of homemade mozzarella cheese bundles, tomatoes, cantaloupe, watermelon, meats and salad. yum!! Marty, the President of Constellations Brands spoke about each of the people chosen for the award and presented them with a pin to represent their hard work and dedication. Very nice! Here's a shot of them all. My husband is third from the left in the blue. 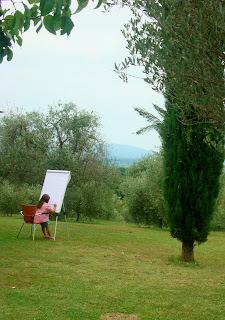 Snapped a shot of this little girl drawing on the easel out in the yard. I can see why artist's are so inspired here to draw and paint. It's gorgeous! She was no exception... probably only 7 or 8 years old. Once we were finished eating, we checked out the hotel and got in a van to venture to a small town called Greve. We toured the main square a bit and learned about the region of Chianti Classico. It was nice to hear the history surrounding this wine region. They are also known for their olive oil and meats. We then made it to Siena and it was PACKED! People were everywhere! 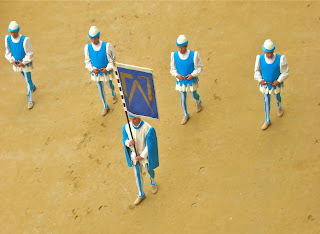 Here is a shot of the streets as a small parade of contradas went through. 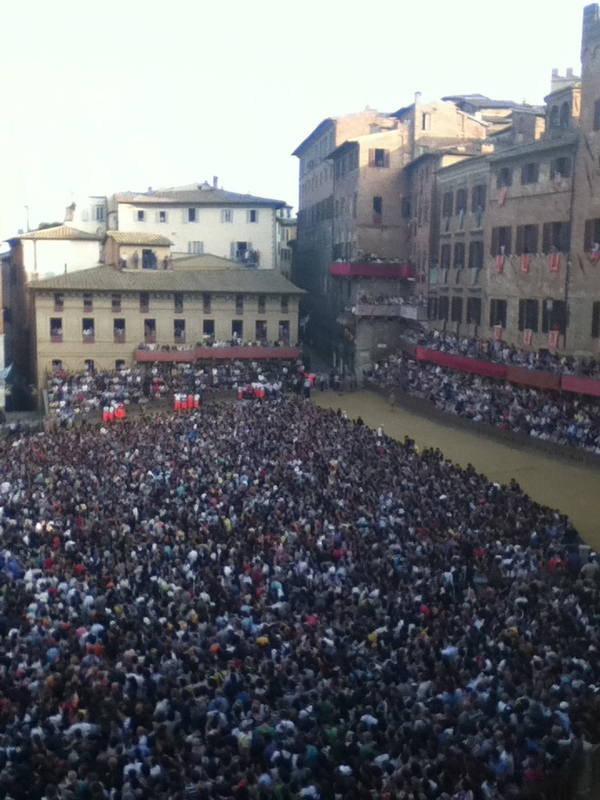 We made it to the Piazza del Campo and you can see the dirt track around the perimeter. It is cobblestoned and they bring in dirt and pack it down and add the fence around the center for spectators. Here there are not that many people yet. It was sprinkling lightly and we were hoping that they would not cancel the race! It stopped and once the parade started on the track, people started taking their seats and places in the center. The center fills to about 40,000 and the stands and balconies hold another 10,000! WOW! The seats in the stands are about 500 Euros each! 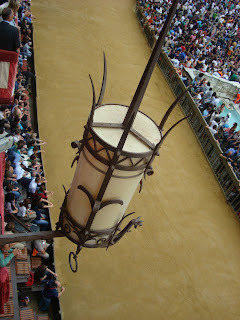 We were in a much coveted balcony which was something we would never be able to do if we went on our own! The seats in the stands. A scuffle where people who were on the edges didn't want to let others in because they might lose their spots! It was tense for a bit watching this! Twig brooms to clean the track. This group of workers did all the dirty work ... even scooping horse poop! Ewww..
Matt and I in the balcony. Medival style light fixture... so cool! look how full it is now! Mississippi- Orca Contrada's horse. He had a design shaved into his hindquarter hair that was so cool! 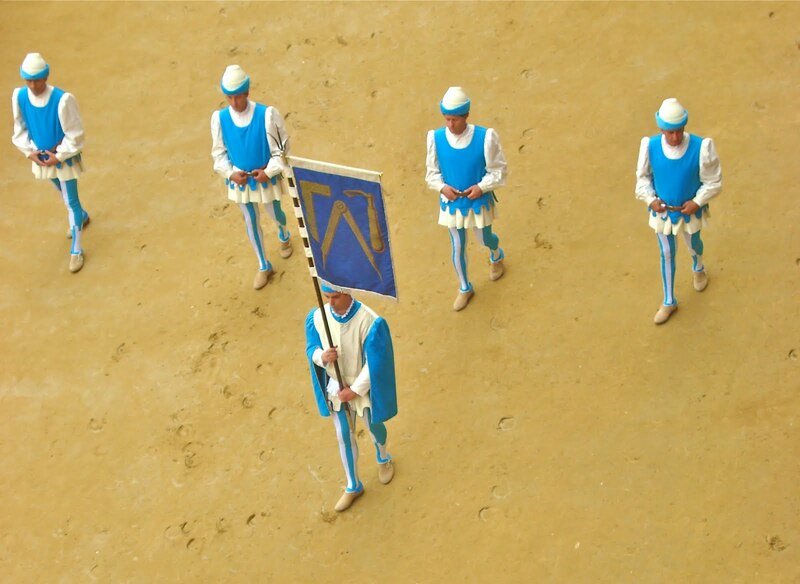 There were only 10 contradas that were running the race. Overall there are 17 contradas. Here is a site that his lots of information about each one. 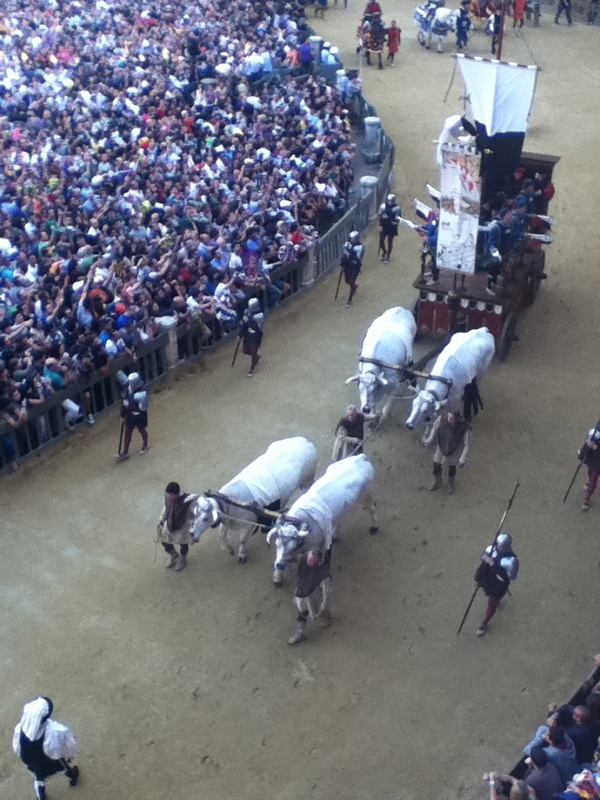 The horses are chosen based on speed and strength. 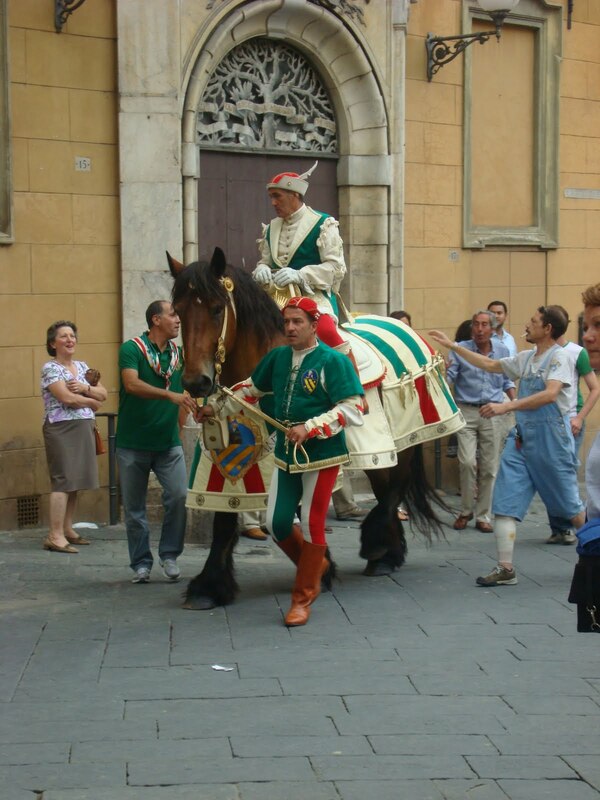 They very much value their horses but these are the best that each contrada has. 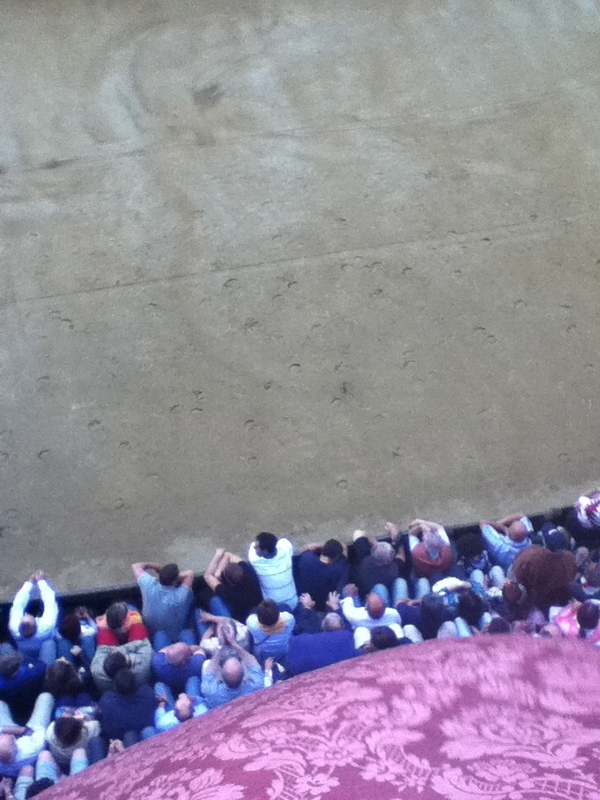 I heard rumors that they drug the horses so they are more aggresive and faster but not sure how true that is. I hope not. One did die the night before the race of a heart attack which makes me sad and the other contradas were very sad that this happened. 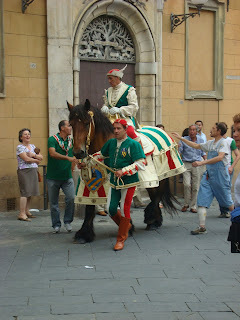 They contrada did march in the parade as well though. During the race, the jockeys are not important to the final outcome. If one falls off a horse, the horse can still win the race. 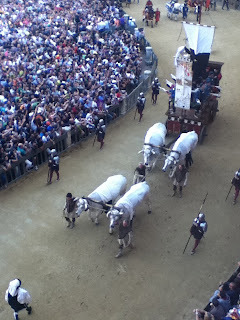 It is all about the horses and the bragging rights for the contrada. Power is a great motivator. A cart pulled by 4 white oxen. They were HUGE! 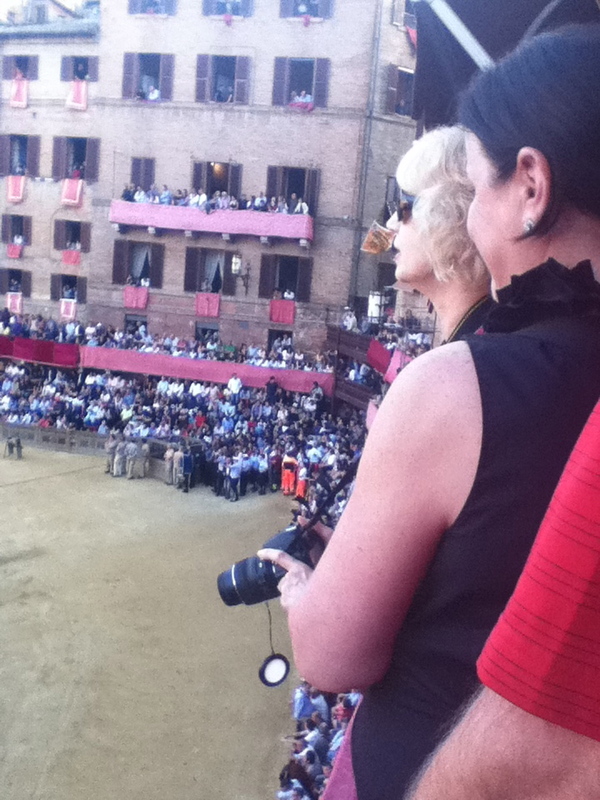 I think the mayor of Siena was riding in the cart. Full! If you have to go to the bathroom during the race, you are out of luck... once you are in the center, you cannot get out until the end! Our view down from our balcony. There were about 15 of us in one balcony! it was a handbag store's backroom! Okay, unfortunately, I got so excited when the race started that I forgot to press my button to record it! BLAH! So, here's a view of it on YouTube. The winning horse was Orca! We had a little bet going in our group and Matt and I had pulled the name Bruca (which was the horse in the lead initially, but the rider got knocked off). The race lasted about 4 laps. It was very exciting!There was absolutely NOTHING like being there in premier viewing (not among the packed crowd!) of a tradition that spans centuries! Unbelievable! I feel so lucky that I got to go and see this with my hubby! The aftermath of the race! 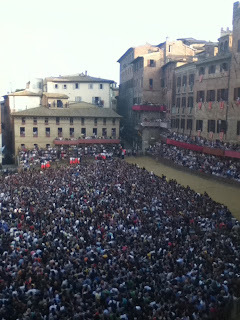 The winning contrada was pouring out and hugging and yelling. We thought it was a brawl but just their emotional winning! Those stands came down so fast! Everything was literally back to normal within an hour! 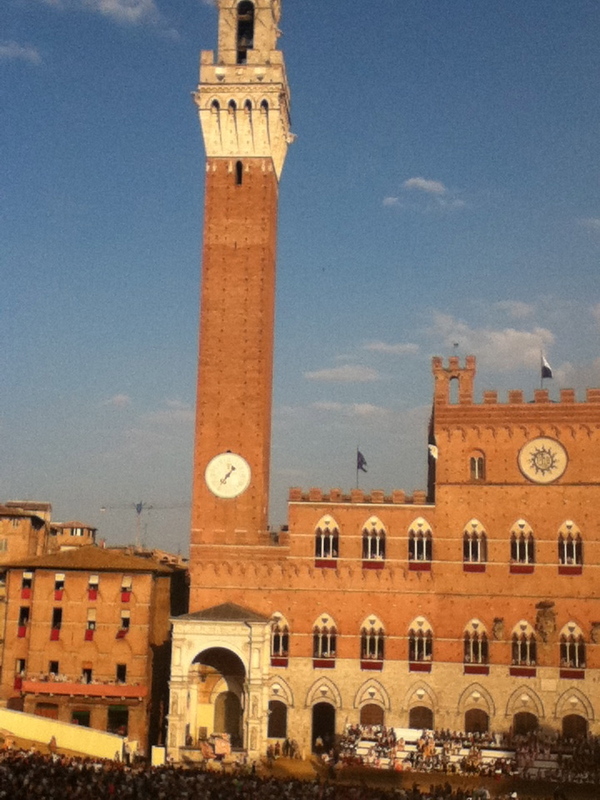 This is where we ate dinner outside of Siena. Gorgeous place and food was AMAZING!!!! Wine with every course again! Finally we got to our hotel in Florence by midnight and it was very fancy. Lots of fabric and glass. The windows overlooked Cartier in the upscale shopping area! WOW! Nice! Okay, next post will be Days 3-4! Wow, what excitement! LOVE the picture of the little girl drawing. Sounds loke you were very brave about the massage. Good for you! WOW! I'm been enjoying all your posts about your travel adventures. What an amazing summer you've been having! Your pictures are beautiful - what an exciting time! Love the massage story! 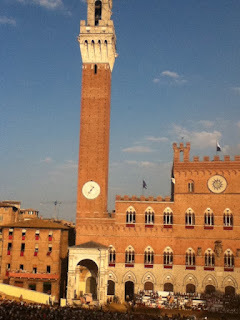 I am a master's student in geography writing my thesis on Siena and the contrade. I was wondering if I could use your picture of the oxen pulling the cart for my thesis? 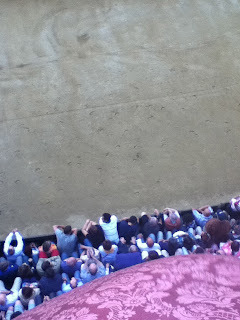 I never got a good shot from the ground and it came up during a google search.